Samsung just introduced at the IFA in Berlin a few Windows 8 Tablets and Microsoft already presented before ATIV S. Will start with the ATIV Smart PC. This is a tablet with Tastaturdock and a 11.6 "Full HD display large. The Pro version differs from the processor, as it offers an Intel Core i5. The "standard model" has a Clover Trail Atom processor. Also has the Pro option a 256 GB SSD and 4 GB of memory, while the other version "only" 128 GB of flash memory and provides 2 GB of memory. Another difference is in the connections. There is the Pro version has a USB 3.0 interface, the standard version has to do with USB 2.0. As expected, the Pro option offers less battery life and is a bit thicker: 8h vs. 13.5 h, 9.9 mm vs. 11.9 mm. In addition, both tablets come with a so microHDMI port and miniSD card slot. The Tastaturdock offers two more USB 2.0 ports. course use both types of Windows 8, and also support from the Galaxy Note and Note 2 known S-Pen from Samsung. Samsung's S score app preinstalled. The touchscreen supports 10-finger multitouch. It is noteworthy that support both WLAN and Tablets 3G and 4G. Gives more details about price and release date are not yet available. Besides the two Tablets with Intel processors, Samsung has also introduced one with ARM processor, the Samsung Tab ATIV It is 10.1 "tall and has a resolution of 1,366 × 768 It also offers a 1.5 GHz dual-core processor, 2 GB RAM, a 8200 mAh powerful battery and 32/64 GB internal memory. 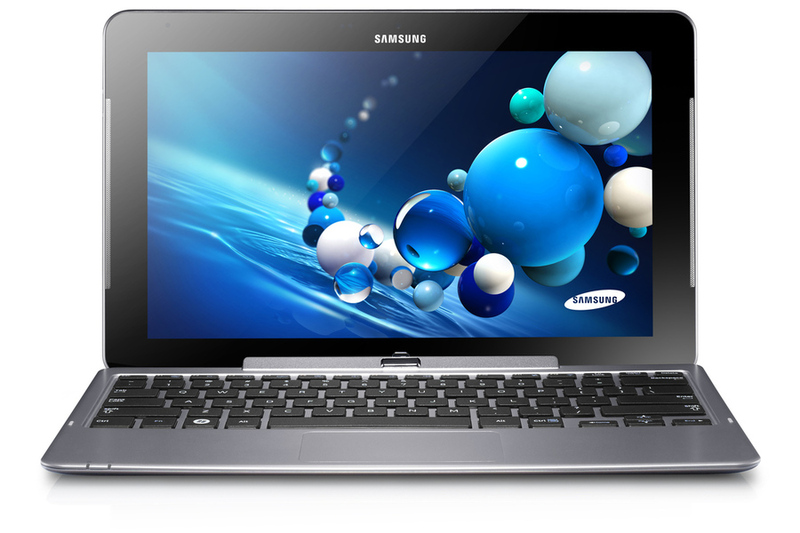 In terms of connectivity, the ATIV Tab Wi-Fi, Bluetooth 4.0, USB 2.0, NFC. The weight amounts to 570 g and the thickness is 9.9 mm.